I wasn’t sure what I expected to see when I bought my ticket for 42. I knew I was going to see the story of Jackie Robinson, the legendary player who wore the number 42 for the Brooklyn Dodgers, and I knew I was in for a chronicle of the challenges he faced as the first black player in professional baseball. I suppose I was also bringing in the baggage of all the other baseball movies I’ve seen that dramatize the sport against the backdrop of a particular era. I was most definitely not expecting to be forced to confront some of the issues the film presented. I was not expecting it to be one of the most inspiring movie experiences I’ve had in recent memory, or to have given me an experience that will last my lifetime. I owe it all to Shirley. First things first. 42 is written and directed by Brian Helgeland, who has penned the screenplays for several movies I’m fond of, including Assassins, L.A. Confidential, Payback and the unique A Knight’s Tale, the latter two of which he also directed. Chadwick Boseman stars as Jackie Robinson and Harrison Ford plays Branch Rickey, the man who signed Robinson. 42 is also scored by Mark Isham, who does a fairly standard sports drama score. You know -- lots of strings, kind of swelling in slowly, but no noticeable themes or anything that stands out too much. It feels like it should. 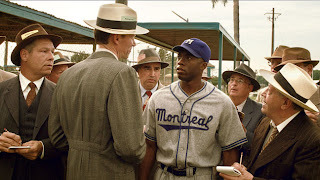 My lack of familiarity with Boseman (who, according to IMDb, has been hosting TV shows since 2003) worked to the movie’s advantage, because I had no trouble at all seeing him as Jackie Robinson. I can see other actors making this more of a powerhouse performance; in the '90s, Denzel Washington was attached to a Spike Lee joint about Jackie Robinson, but that would have undoubtedly been a different performance than what we get here. Boseman remains believable and doesn't simply mug for the camera. He’s someone I’ll be keeping my eye on in the future. And it’s great to see Harrison Ford giving a performance for the first time in what feels like ages. In fact, I believe this is his first film since 2011's Cowboys & Aliens. I didn’t even realize how much I’d missed him, but Ford is back and, at 70 years of age, he’s delivering a good character performance that’s a long way from the cocky bravado of Han or Indy. Honestly, I’m just so glad to be seeing him ACTING again. He speaks gruffly and never appears without a cigar. He’s giving a performance at 70 that’s different from any I’ve ever seen from him, and that he might not have been able to give until now. Nicole Beharie plays Robinson’s wife, Rachel. She does a good job too, showing support and devotion, and they seem to have good on-screen chemistry. She shows herself to be not just a background character, but Robinson’s partner and best friend, a key factor in his success. Without her, he might not have been able to accomplish all that he does, and that is reflected in Beharie’s performance. We see a few other character actors along the way, such as John C. McGinley, Lucas “Tokyo Drift” Black, Alan Tudyk, and Christopher Meloni. Everyone does a good job, but I do have to give particular kudos to Alan Tudyk for the guts it took to take the role that he did and give the performance that he did…but more on that later. 42 starts small, on the baseball fields of Birmingham, Alabama, which is where I live. It slowly grows along with the story of Robinson, expanding bit by bit until we reach the epic crescendo. The pacing is one of the things that I enjoyed the most about the movie. It doesn’t start at the World Series and then flash back to a baby Jackie Robinson in a crib; it starts with a fully grown man on the cusp of the greatness that he would soon achieve. We experience the triumphs and the failures along with Jackie. We go on the journey with him, but in a believable, methodical rhythm. There is no “Hi, my name is Jackie Robinson and I just hit a home run, but let me tell you how it all started.” Helgeland’s script is tight and well balanced, and I never found myself bored or wondering what time it was, or what was for dinner. At slightly over two hours, this film uses every minute well, with little fat. It spends a lot of time on character and people, not on big events. 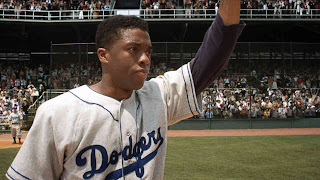 There is no way to talk about this movie without also having a conversation on racism and the challenges that Robinson faced as the first black (and I do say black, after a friend explained to me how offensive he found the term African American) player in baseball, which this movie definitely doesn’t shy away from. Many parts of this movie made me incredibly uncomfortable. Racism is shown throughout the country in this film, from New York to Missouri to Pennsylvania, but MOST of the examples that we see occur in the south. The movie is challenging in reminding us how widespread and open racism was and still is in America, and as a man born and living in the South, it’s difficult to come to terms with quite a bit of it. This is not a subject I enjoy or want to spend time pondering. I would love to say that haven’t witnessed racism in my life, and that the types of hatred shown in this movie are a relic of an era that was over before I was even born. To a certain extent that’s true, but the film serves as a reminder that there is still racism in our world, and I had to confront it during this movie. To be honest, race is not something that I think about all that much these days, if I ever did. I’ve seen it, and I’ve had older men lean across the counter and use racial epithets thinking I was some sort of a kindred soul, but I’ve rarely been that close to it. In fact, whites only represent 25 percent of Alabama’s population. As long as I’ve been alive, I’ve been educated, played, worked, and lived with all races of people, and the blatant racism seen onscreen in the film is very distant to me. I know it’s in our past, but I don’t see it in my daily life. Things are not what they used to be and that’s never, ever been the source of any sort of problem in my own life. I truly believe that MOST (but never all) of my generation sees without color. But Birmingham has been a historical hotbed for racial persecution, and the South was the home of racial segregation: "whites only" bathrooms, water fountains and entrances. That cannot be ignored, and while we are still not living in a totally equal America, things are far better than they used to be, thanks in part to men like Jackie Robinson. What I was not prepared for when I sat down was to hear every single racist insult and name literally dozens and dozens of times. As hinted earlier, Alan Tudyk has given a pretty brave performance here as the racist manager of the Phillies who hurls so much hate speech that I found myself tearing up for the first of several times. There’s a scene in which Robinson is at bat and Alan Tudyk yells every horrible name I’ve ever heard and a few that I haven’t, and Robinson has to stand at home plate and take it; if he fights back then he becomes the man who lost control and gave in to his anger against the white majority. As Harrison Ford tells him, he has to have the guts to say nothing. I wonder how one plays a role like that and not let it get into your head? How do you play a racist and say the most despicable things that you can think of to someone, even when you’re acting? My hat goes off to these actors willing to step into the shadows and don the garb of the vilest among us, give their performance, and then walk back into the light. That scene culminates (no spoilers) in a pretty fantastic performance by Boseman and Ford and the confrontation that results from Tudyk’s insults. If my eyes did not deceive me, it was all done in one shot, and it was remarkable. The result is one of the best moments in a movie filled with powerful moments. Later in the movie, Helgeland chooses to show us an example of how racism is born and learned. A father and son sit in the stadium seats at a game talking about the great things they are about to see and about their favorite players. The father tells the son about the first time he went to a game. It’s touching. When Robinson emerges onto the field, the crowd begins to boo and the father starts to yell hate speech at him. The son, sitting next to him and observing his father and those around them, is clearly taking it all in and decides to make a choice, joining in on the chorus of N-words and insults. The scene, though very short, shows how hatred is born. It brought tears to my eyes. Confession: a few minutes into the movie, my cynical wall had gone up. It’s not something I do on purpose. It just happens. 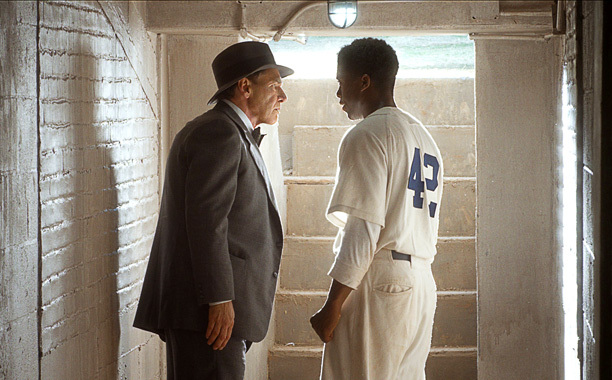 You see, there’s a fair amount of myth-making in 42, and as far as I can tell, the last major motion picture to feature Jackie’s story was 1950’s The Jackie Robinson Story, in which Robinson portrayed himself. By about a half an hour into the movie, I was beginning to feel like the film was “bio-picing” me -- it was telling me a story larger than life to make its subject more interesting. Sometimes (many times) sports movies paint the players as not just great athletes, but larger than life superheroes on par with Spider-Man and Superman. The walls went up. Slowly but surely, 42 forced those shields lower and lower. The story had a lot to do with that, but so did Shirley. Throughout the movie, when Robinson would hit a home run or prevail against ignorance, a cheerful, older black woman (I’d conservatively say she was in her 50s) at the end of our row would softly hoot and clap, rooting for the man on screen as if he could hear her. At first I thought it was cute and fun (and yes, perhaps a little distracting), but as the movie went into darker territory and as the opposition against Robinson became more and more heated and violent, this woman cheered even louder at each instance of triumph. Before long, the cheers of this woman, rooting for one of the first black American heroes, began to move me and make me very emotional. Yes, this is a biopic. Yes, I’m sure events were exaggerated to create drama. But if the real Mr. Robinson experienced half…no, a quarter of what we see Boseman’s character endure on the silver screen, he’s a hero indeed. Eventually the movie came to its conclusion, and the sweet woman at the end of the aisle cheered and clapped enthusiastically. I cannot do it justice here, but her appreciation for the movie was powerful. I sat in my seat, emotionally devastated. I sat there for quite a long time trying to gather myself and make myself presentable to the public again, hoping no one would turn around and see this man in his thirties bawling like a child. When I felt suitably composed, I saw that the theater had largely emptied, but the woman at the end of the row was still there. As my wife and I made our way down the aisle, she said to us "I hope I didn’t bother you too much with my cheering." "No," I replied, "it made the movie even more special. You’re a beautiful person." She introduced herself as Shirley, then started talking about how she had read that the real Jackie Robinson had been through so much more than the movie was able to show, but that she thought it provided a good balance of showing the awful darkness with the happy triumphs of his life -- that we should remember that Jackie Robinson died young as a result of heart problems that he probably developed as a result of the difficulties he faced during those times. She said that if it was so hard for Jackie, how much harder it must be for Barack Obama, the first black leader of our nation, and what threats on his life and family had he endured just by being president? That Robinson should be remembered for playing a part in opening the door through which Obama would eventually walk. She talked to us about how the movie got so much of Robinson’s life correct, and how it was inspiring to see it deal with the realities of racism in our culture today and how things are so much better but still not really better. I’ve never in my entire life struck up a conversation with a stranger in a movie theater, especially not about something as sensitive as race and bigotry. But there’s just something beautiful to me about a white couple and a black woman talking openly about the problems and progress of our country in the flickering glow of a darkened theater. This stands as the most powerful movie going experience I think I have ever had. It was an education, but it was also inspiring. There were all walks of life in that theater, young and old, including an entire little league baseball team of white children. 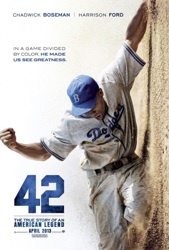 The story of Jackie Robinson needs to be told, and 42 is a fantastic way to spend two hours. It honors the story of not just a baseball hero, but also an American hero whose tale had gone over sixty years absent from the cinema. As a baseball movie, it succeeds. As a drama, it succeeds. But as a story that reminds us how far we’ve come and how far we still need to go as a nation, how much hatred still exists in our country against so many different groups, it’s not to be missed. My experience with this movie will last the rest of my life. Shirley, this is for you. Thank you. I saw this over the weekend and wrote my own review of it. It's a remarkable movie, for sure. I hope Ford gets some recognition for his performance as Blanch Rickey, because it was really great. It was definitely the best and most engaging performance I've seen him give in a while, and he was the best part of this movie. But I also won't take anything away from Boseman. 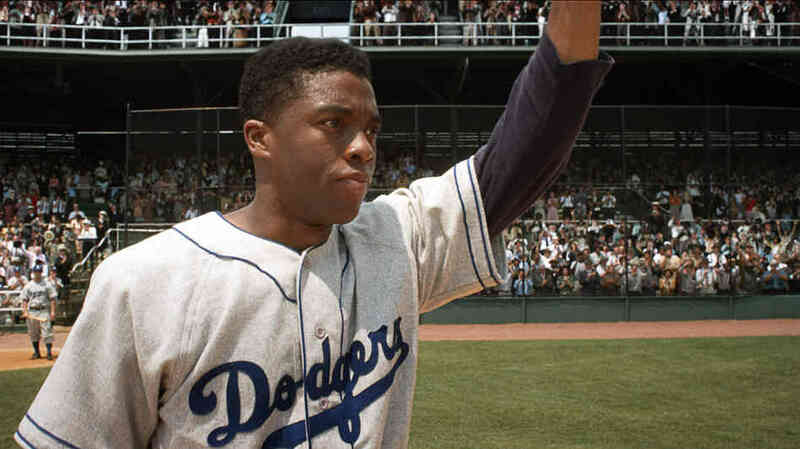 I agree with you that the unfamiliarity I have with Boseman does help the movie, making you believe that this is, indeed, Jackie Robinson, and he is powerful to watch as that man. Now, I'm no baseball expert, or barely even a fan, so I don't really know how events actually went down, but I would have liked to have seen more of what life was like for Jackie outside of the baseball field, and the same for Rickey. The many death threats Robinson received were briefly mentioned, but only briefly. And I am curious of the backlash experienced by Rickey. I don't think they got deep enough into the repercussions I'm guessing he must have experienced for making such a difficult and controversial decision at the time. The same for Robinson choosing to take on such a controversial position. Still, the movie is well-directed, powerfully acted, and even humorous at times. It's touching and inspirational with an important message delivered through the fascinating story of an American sports icon. It's definitely worth seeing. Oops! I am a terrible editor. I just noticed my huge mistake. *Branch Rickey. My apologies. The movie does feel "by-the-books" in a couple of scenes, but it's still an enjoyable movie that’s worth a watch. Good review Heath. Gonna see this with my dad (who's a huge baseball fan) this weekend. I was interested in seeing it definately but i'm hearing it's pretty flippin great so now i'm pretty jazzed about seeing it. Also can't wait to see Harrison Ford act for the first time in years. Great, insightful review!! Branch Rickey is considered a local hero in southern Ohio, where I'm from. He was born in Stockdale and has a stadium and a park at the college I went to named after him. He was a very interesting person. After just having just finished watching this film, a moment ago, I wasn't expecting Heath Holland's response but, as they say, each to their own. Honestly, I thought that 42 was one of the worst historical films I've ever seen. To me, the romanticised history of 42 was terrible. The score was forgettable, as was the acting (I really didn't like Harrison Ford's performance). Thus, I don't consider it suitable for viewing by adults. It's great for inspiring kids to play baseball, but not teaching people "real" history. But, what do I know? Perhaps, I'm just a product of the hyper-realism of many twenty-first century films. The one positive point I can make here is that 42 presents a story of American racism from the perspective of a black man himself. Unlike in Amistad, the white man isn't the protagonist and hero.